Order shipment tracking has long been available in the consumer retail industry. When you order goods from a mail-order retail business, you receive an email containing a link that allows you to check the delivery status of your package at any time – together with any changes to the planned delivery slot. “Many of our customers also wanted to receive notifications of this kind,” says Tim Tuschen, IT Manager at Holz Tusche GmbH & Co. KG. With PTV Route Optimiser you can inform your customers about the estimated time of arrival (ETA) of their deliveries - automatically and in real time. Before the leading wood wholesaler technically implemented its shipment tracking system, its customers would order their materials for prefab or timber construction – their building components, timber and prefabricated parts – and would either know the delivery day from experience or would be informed by the seller when they placed their orders. However, the customers of this medium-sized family company still had some unanswered questions. What time would the goods get to them? Were they already on the way? How long would their employees have to stand by to receive the delivery? When could their downstream processes begin? As Tim Tuschen explains, this lack of information resulted in “daily, time-consuming queries being submitted by customers to our sales team, who then passed them on to our dispatchers, who in turn passed them on to the drivers. This took up employee resources on both the customer’s and the supplier’s side”. On the hunt for a professional notification system, Holz Tusche turned to its business partner, PTV Group in Karlsruhe. 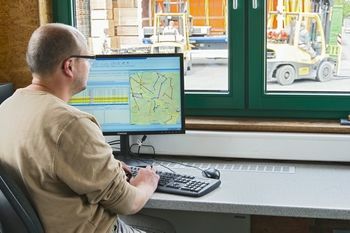 Dispatchers at Holz Tusche have already been using PTV Smartour to plan routes for some years, while the company’s sales team use the additional Trip Display function for internal information flows. This route planning software has now been further expanded through the integration of the cloud-based service PTV Drive&Arrive – which salespeople and customers alike can use to be informed about planned arrival times, current truck locations and any changes to the estimated time of arrival (ETA). “As soon as our dispatchers have finalised the delivery planning, our customers automatically receive an email containing the scheduled arrival time on the following day. This is specified as a two-hour time slot,” explains the IT Manager about the new service. A link inside the email takes the customer directly to an individual area on the Holz Tusche homepage, where the specified ETA is continuously updated. 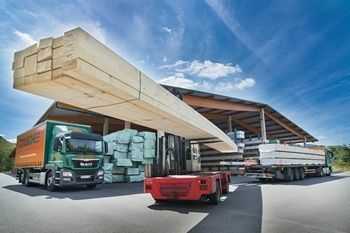 Holz Tusche has fitted its 18 lorries with modern navigation technology to make this technically possible, and the interplay between the navigation equipment and the PTV software transforms strategic planning data into real-time values. These are calculated based on up-to-date traffic data, times of day, delays at previous unloading points, and the position notifications that are transmitted continuously by the vehicles. The result of all this is a predicted arrival time that is accurate at every stage – from the depot right up to the recipient’s unloading bay. Of course, it’s not just customers who benefit from the shipment tracking system – there have also been many improvements in the company’s internal procedures. For example, the wood wholesaler’s sales team can now view all the information relating to each delivery without having to send queries to the dispatchers. It’s quick and direct, saving time and money – which is where Tim Tuschen and the entire sales team see the highest efficiency. Another significant benefit is the optimised deployment of staff. Instead of having to make countless phone calls each day and go to great lengths to find out delivery times, the sales staff can now focus on other vital tasks. Founded as a timber merchant in 1934, Holz Tusche GmbH & Co. KG is now one of the leading wholesalers and importers of wood in Germany. This medium-sized family company is headquartered in Marsberg in North Rhine-Westphalia and boasts ultra-modern cutting facilities, warehouses and its own permanent showroom featuring a range of doors, flooring, walls and ceilings. The company’s depot features superbly organised logistics and guarantees rapid product availability – from individual decorative laminate boards to 18-metre-long beams for prefabricated housing. Holz Tusche sells wood derived from verifiably legal origins and sustainable forests, and this is underpinned by FSC® and PEFC certification. We are at your disposal to assit you.